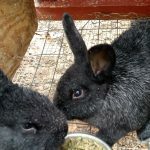 In Part 1 I gave an overview of our rabbit grow out practices in the growing season, and profiled a rabbit breeder’s choices for growing out rabbits in winter. Here I will detail the grow out method we are using this winter. 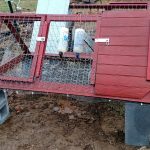 This winter we are using our portable rabbit tractors as grow out pens over winter, but we have retrofitted the pens so we can elevate them for winter use. You may ask why do we need to elevate them? There are two reasons. First, it is very important to keep rabbits away from their droppings to prevent disease. All animals should be kept off their droppings, really. Second, the tractors could be difficult to access or even buried in snow if left on the ground. Last year we had a 30″ snowfall! While that was not the norm, we must consider accessibility in snow. The issue with the rabbit tractors that we needed to address to elevate them was the flooring. During the growing season the tractors are on the ground, and we want the rabbits to eat the grass the tractor is on. Therefore, the floor is covered with horse fencing comprised of 2″x4″ holes. This works great in the growing season! It keeps the rabbits from burrowing out, but it doesn’t push down or cover the grass; they can graze very well. The holes would be much to large when the tractor is elevated, though. The rabbits would have nothing to stand on! To create a floor that would hold in rabbits while letting their manure pass through, we covered the base with 1/2″ hardware cloth. We ziptied the hardware cloth to the current flooring all around the perimeter of the rabbit tractor. Since this is something we will take off when using the tractor in the growing season, we wanted an attachment method that would be easy to undo in spring. Zipties will be very easy to cut. That was the only alteration needed to prepare the rabbit tractors for elevation. So we took cinder blocks, spaced them at the tractors’ four corners, and elevated the tractors. We put them in the garden, where the manure could fall on the ground and enrich the soil. You can see how two tractors were able to share one set of cinder blocks, meaning for every two tractors we need six blocks. We cannot combine tractors any more than that because we wouldn’t be able to access the tractors’ doors. We’ve had young rabbits in the elevated tractors for a few days now, and so far the elevated tractors have worked beautifully. The rabbits easily hop around on the hardware cloth flooring. 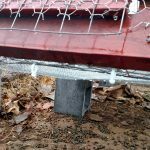 We have been very happy with this solution for growing out rabbits in winter!